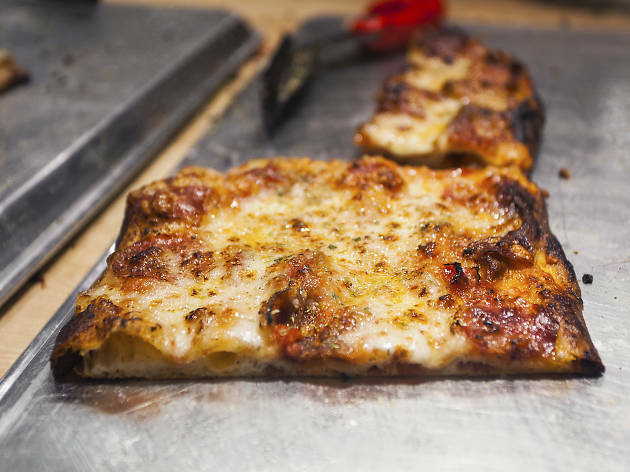 You're going to pay by the ounce for this pizza, but you're going to want to eat pounds of it. When Matt Molina, the Silverlake Wine crew and Mozza magnate Nancy Silverton team up, you throw down. 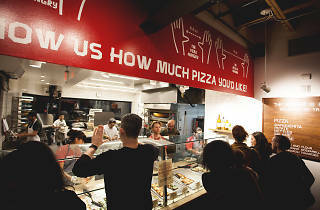 At Highland Park's only Roman-style pizza spot, the staff slings scissors-sliced pies that rotate daily. 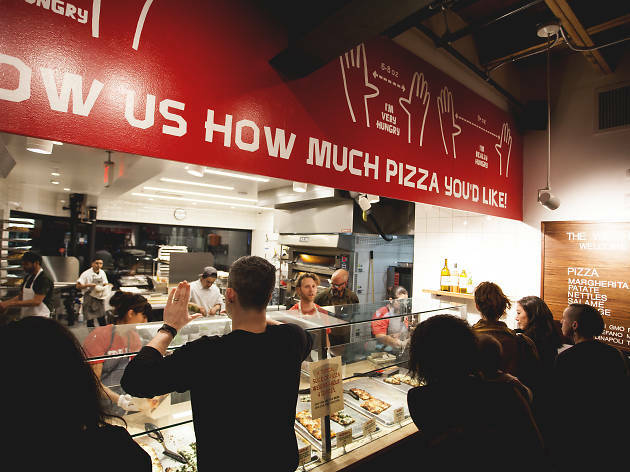 Order one of everything at this fast-casual joint, where you pay by the ounce (or by a "thiiiis much" show of hands) for high-end pizza at a fraction of Pizzeria Mozza's prices. Of course, the style and flavors are far different than what you'd find at the Mozzaplex—Molina takes full control of the menu here, resulting in a few creative concoctions we never knew we needed: sausage with fennel pollen and onions; shaved asparagus with ricotta; smoked pancetta with jalapeño, caramelized onion and fontina; spicy zucchini with mozarella-wrapped ricotta. Thanks to guidance from the Silverlake Wine owners (who also opened a bottle shop in the same complex), this spot also pours beer and wine. And as time's worn on, Molina & co. have added items to round out the selection of five or six pies, and now offer a daily vegan pizza, a sandwich, cannoli, salads and a small range of focaccia. Our only complaint? 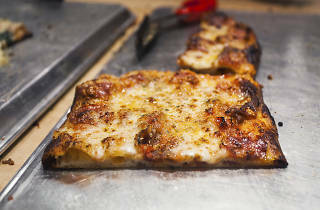 Even fresh-from-the-oven slices don’t stay warm long, so eat ‘em on the patio ASAP (not that you could resist, anyway). The truffled potato, rosemary and fontina pie is the move. Don’t sleep on the focaccia of any variety. There's a standing bench right out front, if you can't wait to dig in, but the ideal place to enjoy Triple Beam is on the outdoor patio, near the parking lot. It's a shared dining space, and seats go quickly, so keep your eyes peeled for a spot. The rotating options for wine are brief and ambigulously named—"white," "pink," "bubbles" or "Dolomite red"—but they're under recommendation of the Silverlake Wine team, and those guys wouldn't steer you wrong.